'Eat clean, workout everyday and live healthy'. This just about summarizes my health resolutions for the next year. And while everyone is waiting for the clock to strike midnight on the eve of New Year for going ahead with their resolutions, I believe in doing it 'now'. Yes, my resolutions are very much 'on the floor' as I am consciously making healthy choices even as I eat out (rarely though) during this festive period. For example, just last night I opted for an 'Penne Arrabiata' instead of digging into those sinful pizzas, pies and creamy pastas that everyone was ordering. And picked a plain lime water to go with it. No soda . No sugar. Hardly a bad choice when I think about the number of calories that I avoided in one single meal. Small changes that go a long long way in one's battle against the bulge. And since I am totally focused on the 'eat clean' goal for 2017, 'drink clean' also becomes an inseparable part of my goal by default. It is hardly possible to meet the goal of keeping one's system clean if one is guzzling up on those chemical/alcohol/sugar laden drinks. And for that sole reason, I will be sharing more about natural drinks on the blog in the coming year. Coming back to our last collaboration ( with Parinaaz's A Dollop Of That ) for 2016, we are sharing the recipes for some celebratory drinks/mocktails that will add zing to your house parties. Skipping the alcohol, we are keeping it colorful and refreshing. My contribution is a Kahwa flavored bubble tea. Sourced from the pristine Kashmir valley, this variety of green tea is much more flavorful that the others I have tried till date. And as far as bubble teas are concerned, they are going to be the next big thing ! Don't you want to be the first one to introduce it to your guests ? Preparation - Wash and soak the tapioca pearls overnight. Take out 2 tsp of the soaked pearls and add to a saucepan along with 2 cups of water and a pinch of saffron. Boil till you get a thick gel like consistency. Color the remaining pearls with the blue dye. Boil 4 cups water in a saucepan along with cinnamon and cardamom. Switch off flame after 5 mins. Add the green tea and cover. Keep aside for 5 mins. Strain and let it cool down. Pop it into the fridge for 15-20 mins. Sweeten with honey as per preference. 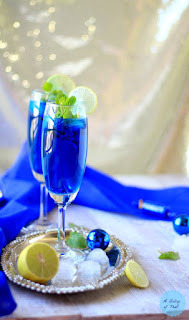 For assembling the final drink - Place 2 tbsp of the blue pearls at the bottom of a tall glass. Top it up with the golden saffron flavored gel. Now very carefully, top it up with the chilled Kahwa tea. 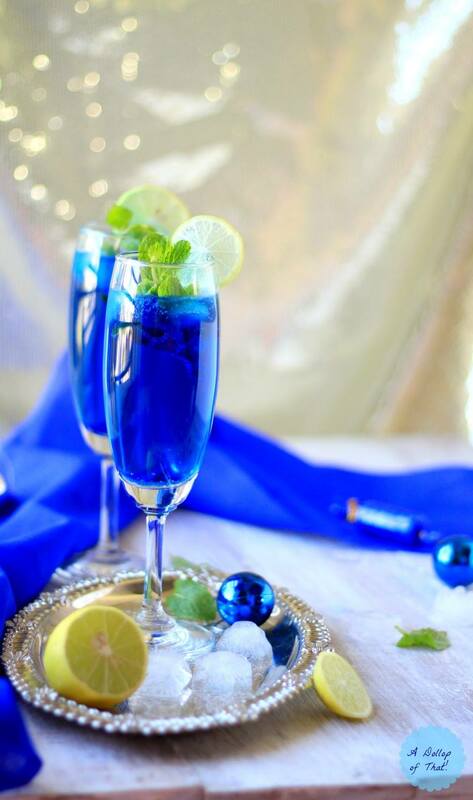 Blue Mule Mocktail by Parinaaz !! I'm most definitely trying this recipe and your eat clean mantra too!